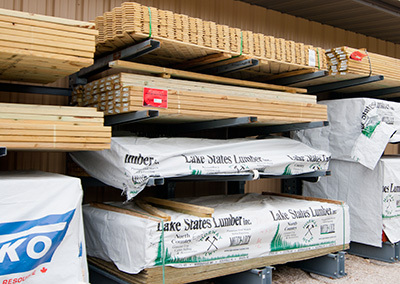 Stop on By and Check Out Our Lumber Selection for all your lumber needs. Harbor Hardware is the ONLY lumber supplier between Sturgeon Bay and Sister Bay! Find all your lumber supplies at Harbor Hardware. Our wood inventory is the best selection with top brands like Lake States Lumber and Tolko. Hobbyists and wood professionals alike can count on Harbor Hardware to always have in stock the best lumber supplies in Door County. The key to our wood success is carrying top notch lumber choices and having the most knowledgeable sales associates. We pride ourselves on our very helpful customer service, our staff will take the time to help you plan your project and select the materials you need for a great-looking project. Whether you're looking for lumber for a large project or a small project, you can't go wrong with Door County's best lumber store.